NEW YORK—As part of its effort to provide the most comprehensive reporting possible on the freshman congresswoman, Fox News announced Wednesday the debut of a new premium television channel that will offer continuous, around-the-clock updates on Rep. Alexandria Ocasio-Cortez (D-NY). “For an extra $8.99 per month, you’ll have an all-access pass to the AOC Zone, which features wall-to-wall coverage of every word Ocasio-Cortez utters, as well as in-depth analysis of her wardrobe and any videos we’re able to dig up from her college days,” said Fox spokesperson Avery Mattison, adding that the new channel will include uninterrupted live footage of the 29-year-old representative every time she appears in public, along with nonstop commentary from a 12-person panel of experts. “We know our viewers will come to depend on this outlet for 24-hour coverage of AOC, which is why her tweets, Instagram posts, and her latest wacky policy proposals will appear in a ticker at the bottom of the screen. 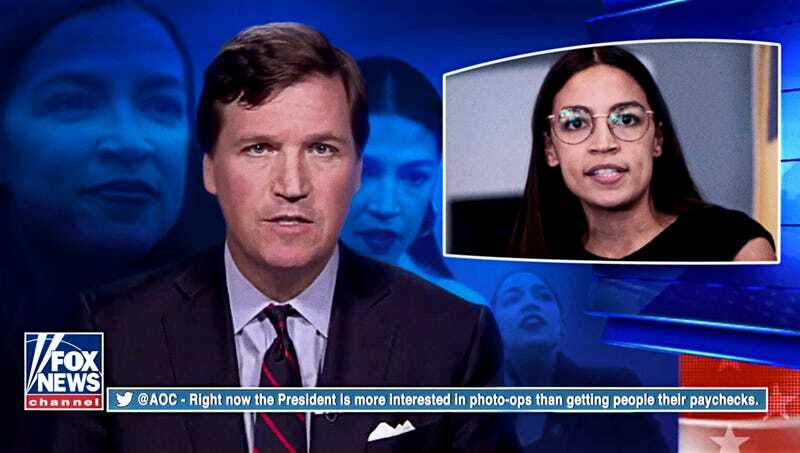 We’re particularly excited for the premiere of the channel’s flagship program, AOC Tonight With Tucker Carlson.” Minutes after AOC Zone began broadcasting, sources confirmed its ratings had already surpassed those of Fox News.